THE CHIEF executive of NHS Shetland has suggested more needs to be done to encourage young people to be more active after a report revealed that less than 12 per cent of local 13 and 14 year olds said they met recommended levels of physical activity. Ralph Roberts told a meeting of the health board on Tuesday that it felt like “we play to the converted” when encouraging youngsters to be more physically active. He said the “engagement with the hard to reach…is something we do need to make a step-change in”. A public health annual report for 2017/18 presented by director of public health Susan Webb said that “we urgently need to increase levels of physical activity amongst children and young people in Shetland”. Only 11.5 per cent of 13 and 14 year olds in Shetland reported that they meet the recommended physical activity guidelines, and 51 per cent said they wanted to be more active. The aim for people aged between five and 18 is to be physically active for at least an hour a day. 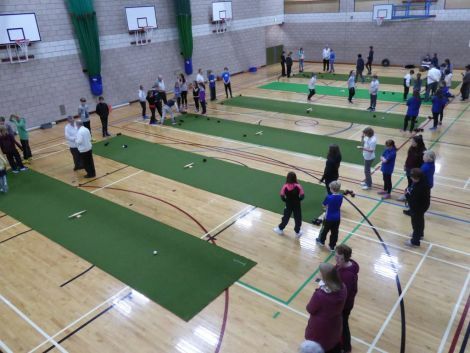 Roberts admitted it was “ironic” that Shetland is proud of its sporting facilities – yet it seemed to fall short when it came to active youngsters. The report also showed that in Shetland fewer than 90 per cent of children received the recommended two doses of the MMR vaccine by the age of five. It said there is an aim for 95 per cent uptake to achieve ‘herd immunity’, which is when enough people in the population have immunity so that the bug cannot easily spread to unvaccinated individuals. NHS Shetland chairman Gary Robinson questioned why the uptake was relatively low, adding that the scare in the late 1990s linking the vaccination with causing autism had now been “debunked”. “I think it’s really critical that we get it [the uptake] up,” he said. Director of nursing and acute services Kathleen Carolan said Shetland had traditionally struggled with MMR uptake and added that part of the reason for the figure is parents with multiple children who decide against the vaccination. The public health report added that in 2015 11 per cent of secondary four pupils said they drank alcohol on a weekly basis. It said “levels of alcohol consumption among Shetland teenagers have decreased in recent years and are amongst the lowest in Scotland with 14 per cent of 15 year olds reporting that they regularly drink alcohol”. “However, we should not be falsely reassured; the small number of teenagers who do drink, drink heavily,” the report added. Councillor Malcolm Bell said there remains a drinking culture in Shetland which is “accepted” in some sections of the community. The report also said that the most recent figures for breastfeeding at 6-8 weeks show that Shetland’s rate of 65.1 per cent was the third best performing health board in Scotland. The rate of mothers smoking during pregnancy has fallen to 6.3 per cent from 14.1 per cent last year. One other takeaway message from the report was that stressful events like domestic violence, neglect or living in a household with alcohol or drug problems can create ‘adverse childhood experiences’, which gives people a greater risk of experiencing health conditions in later life.